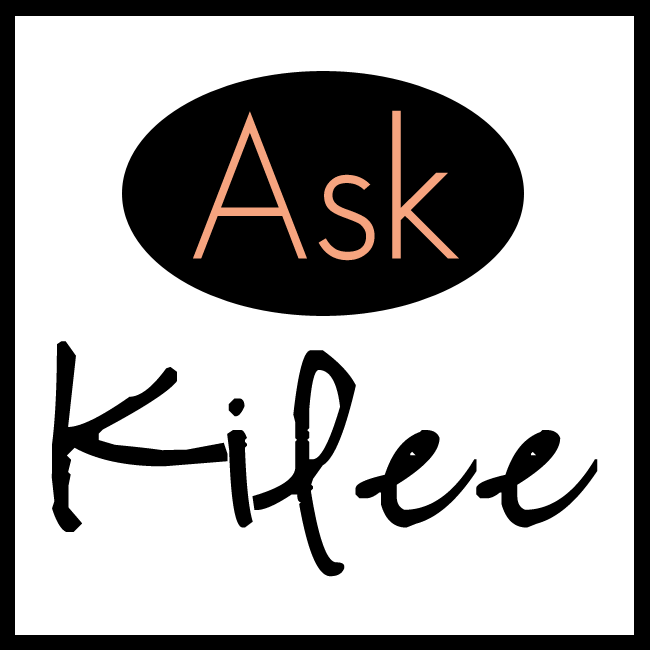 I'm excited to share the first edition of Ask Kilee. I mentioned when I announced this series that I get a lot of questions from readers in my email that I just don't have time to answer no matter how much I wish I could! This series hopefully will help me get them answered and allow me to share more of what I leave out about life in my normal posts. Feel free to send questions in any time. If you sent in a question and I don't answer it this month, I'll get to it next month, or I may have a full post in mind for answering your specific question. My husband & I have been talking about expanding our family. We have one daughter, she is 2 years old. Do you have any suggestions for preparing her to be a big sister? It is amazing how quickly time passes because I hardly remember only having one kid! But I do vividly remember the scared feeling of having our second. Although what I was most worried about was having room in my heart for a second - which worked out. As far as prepping a sibling, I think the best way is to talk about the baby a lot. Create a new space for the baby in your house, like a nursery, so there is physically a new bedroom or bed for your daughter to understand is for a new family member. My first boys were 18 months apart, so the oldest just kind of went with it. It only takes a few weeks for it to feel like you have always had two. The important work I think happens when you talk to your first child about what it means to be a big sister (or brother) as they get a little older. When Easton (our oldest) was about 3.5 years old, my husband and I talked a lot with him about what it means to be a good older brother. He knows now that it is his job to protect them, help them, teach them, and be a good example to them. He gets in trouble specifically for that sometimes, but it has worked! He really is a great older brother and I'm so glad he feels a sense of responsibility for his youngers. Siblings are a huge gift to your kids and I think they are made to adapt to them and love them! I have two lovely daughters, and lately my husband has been pushing for a third. Which transition did you find the most challenging? I'm afraid if we go for it, I'll completely drown. Going from 1 to 2 was nearly the end of me! Well I hate to say it, but yes, the transition to third has been the hardest for me. There are so many factors that play into how hard the number of kids are - from how close they are together to how much your husband works. Every situation is different, but yes, three has been a rough adjustment. When my third was about 10 months old I was feeling on top of things again. I had adjusted to three in a lot of ways and felt like I was killing it. But then we launched our business and I've been behind again ever since. This last week we had sick kids and yes, I felt like this is too many crying kids! But then yesterday they felt better and took naps and played nicely and I felt on top of the world again. It is like anything else, things get hard, then you get stronger, then they get hard again, and then sometimes you get a break. To answer your question, I honestly feel like it is such a personal decision, but if you want to have more kids and have faith in having a bigger family, then you will grow and rise to the occasion. There are a lot of things that are hard in life, but no matter what, it is our attitude and where our faith is that determines whether we grow through them. Having a big family is important to me, and I have faith in my calling to be a mother. We want to have more kids, but I know the next transition will be hard too. What I have found is that I have grown so much from the challenges that each child has brought, and they have brought even more light and love to my life. What have you found to be your best way to deal with stress? I'm a part time working, part time SAHM and I do believe being a SAHM is far more stressful than working! So I'm always looking for quick, effective ways to relieve some of the stress and anxiety I feel every day, hopefully without medication! Ahh, stress - my constant companion as of late. :) I wish I had a super helpful answer for this. I have really been struggling with it myself and I have found a few things lately that have reduced it, but I know there are more things that I could do. Some things that have helped are to get more sleep (I never get enough! ), try to say no to things so that my plate isn't so full, and create a schedule. The more planned out I am with a rough schedule about what they day holds, what the week holds, and what is for dinner, the better off I am. I also recently ordered Young Living Essential Oils with the hopes of getting some relief from my migraines and stress. I felt really skeptical of them at first, but we are giving them a try and I'll be sure to post how they helped us. I have also been reading Daring Greatly and it has more to do with reducing stress and anxiety than you would think! And pedicures with friends sometimes help too! Do you straighten your hair every day?? How do you find the time? I do straighten my hair almost every day. Because of my short hair I have to do something to it - there is no pony tail option. I try to curl it the next day so that I can skip the shower and blow dry time, but I love showering, so usually I do. I've always blow dried and straightened my hair, so maybe my kids just expect that they play while I get ready? My hair is also quite straight, so after I blow dry it with a round brush, it is almost ready to go. My favorite thing to wear at home is leggings and an over-sized cardigan. But in general, I love dark skinny jeans, a soft pull over sweater and some kind of wedge shoe. You say that you work out in the mornings? What kind of workout do you do? Weeeeellllll - I used to, and I like the idea of working out in the mornings. Currently I don't work out - and haven't since our business launched in June. It has been too crazy to find the time, and although I'm sure it would help my stress (see above), it just hasn't happened. I do love to run, walk, lift, weights and do Pilates. Sometimes we'll do 5k's as a family, but I usually walk with the stroller these days! Thanks so much for your questions! Feel free to send more over and I'll get them in next month. I definitely love the direction that they give to help me pick what to blog about and where to spend more or less time posting about. Concerning the 3 kids question, I do find it harder too since we have 3 kids. I felt 2 was so natural, but 3 means there's always someone who needs mommy, harder to manager homework time, more laundry (including folding), more preparation to leave in the morning, more conflicts between kids, etc. So, I often feel tired and have less patience. HOWEVER, I would NEVER EVER go back to 2 kids. It just brings more love in the family, more balance as well. It reduces the face-to-face conflicts or one parent taking one kid's side and one parent with the other child. If there is a conflict between 2 kids, they just go see the 3rd. When we play altogether, we really feel we are a "family", there are so many bonds. I was also scared we would not be able to do grown-up activities with the older ones, and this is not an issue at all. We love including the youngest one and we feel empty when she's not with us. I agree that the number of children a couple has is between them and God. Going from 2 to 3 kids was hard for me too (not sure if it was cuz #2 had behavior issues and #3 had special needs the first 7 months, or just my attention divided). But we wanted more. Then I found out I was pregnant with twins! How could I handle 5 kids (3 of them 2 & under), when 3 kids was hard? Well, 6 months in, we've made it because I've said yes when people offer to help (a lot when they were little, not as much now), and God has helped out as we've turned to him. He helps with patience (I need it), ideas of how to help kids, and the strength to let the little things go. I've had to give up singing in a choir & exercising (while I'm nursing), but we are getting along and happier in our marriage than we've ever been...well, I am, I don't think my hubby likes to talk abt things like that. I have several pairs of wide leg jeans, any advice on how I can make them apart of my everyday outfit while still being fashionable? Or am I better off just getting rid of them, HELP!! !